POSITIVE SIGNIFICANCE: Food fish. Comments: The main deep dropline fish of the Northern Group. Cooks: Allen 1985, FAO Fish. Synop. #125 (v.6). Rarotonga: specimens ID N.Sims (Sims88). Palmerston: dominant species, deep-bottom handline (Preston95). 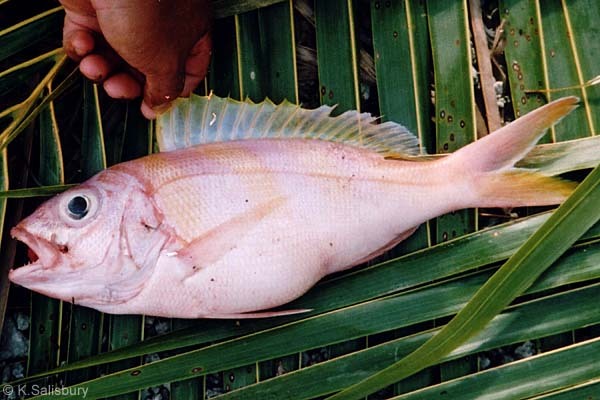 Tongareva: dominant species, deep-bottom handline (T&P85). Pukapuka: fieldspecimen+photo, 3/2004, K.Salisbury, ID as Pristipomoides zonatus by G.McCormack, 12/2004. 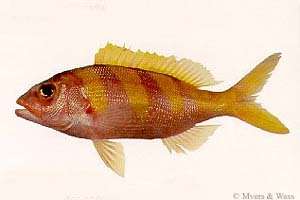 Special Reference: Allen 1985, FAO Fish. Synop. Snappers of the World... #125 (v.6).